Hafjorg is an elderly apothecary who helps her husband Elgrim run his alchemy shop, Elgrim's Elixirs. 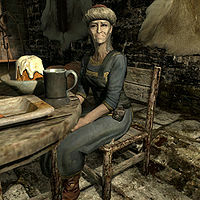 She is generally warm towards her husband and you, but does provide slight nagging in reference to the location of the shop along the Riften canal waterways. She is typically the one behind the counter, although she will also offer services while sitting at their dinner table. She needs help retrieving an ore sample from Filnjar at Shor's Stone, and will reward you with random potions if you retrieve the ore for her. Elgrim's Elixirs is open 24 hours a day, so you can trade with Hafjorg at any time. She wakes up at 6am, then wanders around the shop until 9am for a one-hour breakfast. She wanders around again until 11am, then she starts her job as shopkeeper. She ends her workday at 5pm, spending an hour relaxing before she has a one-hour dinner at 6pm. She stays up until midnight when she goes to bed. She wears a set of merchant clothes, boots, and a hat. She carries a dagger (up to elven quality at level 20), the key to the shop, a belted tunic, along with a selection of middle-class items and gold. When you enter the shop, Hafjorg may greet you with "This place has seen better days, but it's not my fault." or "Where's my head? I never even greeted you properly." Approaching her if you have not finished her quest will have her ask you, "Have you managed to make it out to Shor's Stone?" If you have, she may instead say, "Thanks again for delivering that ore sample." Upon ending conversation, she'll tell you, "Don't forget us if you need supplies for your journey." If you have not finished her quest, she may instead warn you to "Be careful, the road to Shor's Stone could be dangerous." Should you ask her if she is an alchemist as well, she will answer, "I know how to mix a few basic potions, but I'm nowhere near as skilled as a master alchemist. I've picked up a few tricks by reading the tomes scattered all over the shop, but I don't have the knack to pull half of the formulas off. I wish Elgrim had spent more time tutoring me then that Ingun girl." You can then further ask her if she's jealous of Ingun, which she'll laugh off with "Oh! No, I didn't mean it that way. Elgrim can barely put his on his own shoes let alone have the energy to pursue a young girl." She'll continue by saying, "He's been gushing about how talented Ingun is at alchemy. He'd never say it to her face; that's not his way. I just think Elgrim's taken it upon himself to mentor the young thing so he focuses a lot of attention on her." If you ask her, Hafjorg will confirm that it bothers her living underground, saying, "When Elgrim said we were setting up shop down here, I told him he would catch his death. The dirt, the moisture... it's disgusting. Who wants to spend their life living like a skeever?" She'll end with frustration: "But that old bellyacher just fed me some nonsense about light ruining his mixtures and being close to the water... agh." To start her quest, you need to mention to her, "You've got your hands full, eh?" She'll reply, "I swear, if I wasn't around, Elgrim would forget to eat his meals. How we make any coin at all is beyond me. In fact, I need to arrange for someone to pick up an ore sample for me in Shor's Stone... goodness knows Elgrim won't lift a finger to do it." Telling her that you could get it for her will have her say, "You would? Oh, that would be wonderful. Speak to Filnjar in Shor's Stone. He's got some sort of ore sample he wants us to identify and was willing to pay us well for it." You can instead wish her luck with that, and she'll tell you, "The job pays well, so I hope I can make arrangements soon. We could really use the gold." She will be grateful once you bring her the requested ore sample, saying, "Thank you. I'll be sure to get Elgrim to examine this as soon as his... busy schedule allows." She will give you a few random potions Elgrim concoted: "Here, I had him make you a few things for all that travel." Offering her a pamphlet from the local temple of Mara will have her say, "Hmmm. Never read anything from the temple before. I suppose there wouldn't be any harm in reading it." Her husband Elgrim will mention her, should you ask him if he works alone. He'll say, "Hardly! In fact, I don't know how I get anything done with all of the distractions I have to put up with. My wife Hafjorg, well, she's a necessary evil I suppose. Not a lick of talent when it comes to alchemy, but she keeps me fed." Hafjorg: "Elgrim, honey. I'm concerned about your new pupil. She seems very... odd." Elgrim: "Ingun? She's brilliant; a natural!" Hafjorg: "Oh dear, I didn't mean to say she isn't bright. It's the things she makes here, the things she says and all those poor little animals she tests them on. It's just not right." Elgrim: "Damn it, woman! Ingun is the most promising alchemist I've ever seen and I won't have you scaring her off!" Elgrim: "Hafjorg! Where did you put it woman?!" Hafjorg: "Sigh. What is it now, dear?" Elgrim: "Don't you 'dear' me! I had a bowl of Vampire Dust on my worktable not an hour ago and after you swept in there it's gone!" Hafjorg: "Oh my. Elgrim, it's on the shelf to the right of the table, as always." Elgrim: "Ah, I see. Well, just be careful around my things!" Esta página foi modificada pela última vez à(s) 11h11min de 31 de dezembro de 2013.